I do really like these three Chinese (traditional/cultural) objects (Calligraphy, Beijing opera, oil paper umbrella) as a lightening rod for concept development. As mentioned in the previous blog post, I am conveying an intangible function from a tangible object/example. Thanks to my instructor’s feedback, I have expended the idea of looking into calligraphy and started to focus on the Chinese Four Arts which include Guqin(music instrument shown in image 1), Qi(board game shown in image 2), Shu(Chinese calligraphy shown in image 3), Hua(Chinese painting shown in image 4). They were the four main academic and artistic accomplishments required of the aristocratic ancient Chinese scholar-gentleman. From my personal nostalgia, I also deeply appreciate the dream landscape of Jiangnan, China. Over thousand years of histories, poets beautifully expressed the views they seen and stories they experienced in Jiangnan. Such rich backgrounds have made the place heaven like. 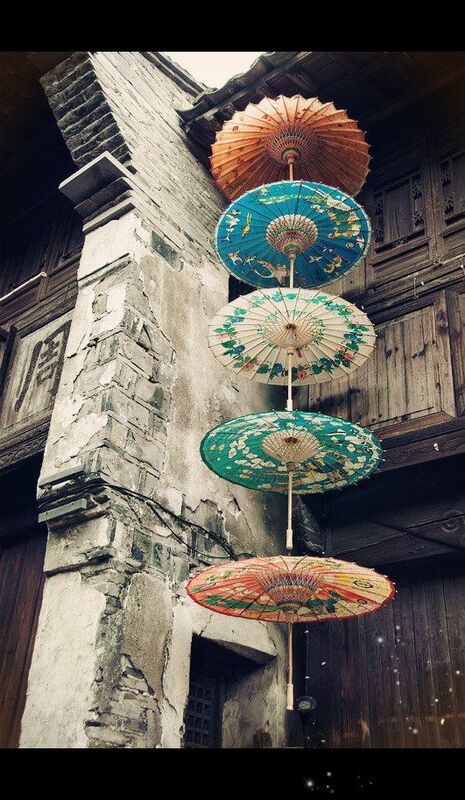 The oil paper umbrella is an iconic object locally (image 1 and 2 below), it perfectly capture the Jiangnan’s poetic and romantic beauty. Serenity, quietness, and calmness are three words that I would describe 2 and 3 images above. 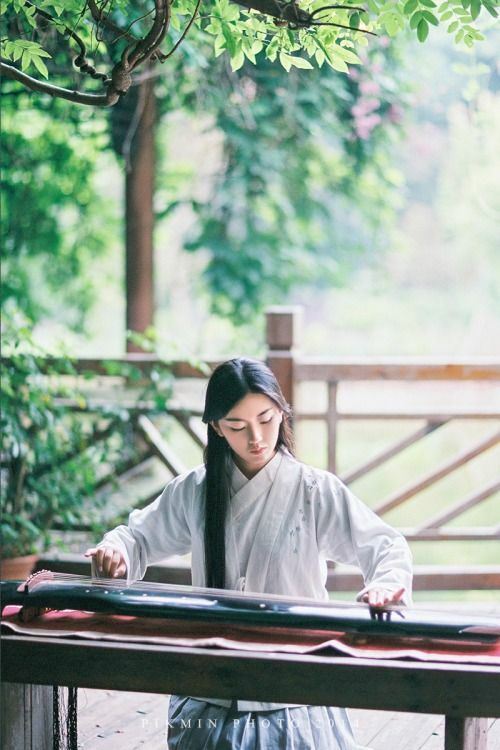 The individual of Chinese Four Arts has completely different in its application and form, but they all require the person to be emotionally calm to learn and practice. There is an ultimate personal serenity needed to master the medium, at the same time it requires physically and psychological movement to cooperate. Further, Jiangnan’s view embodies such natural poetic beauty and indescribable quietness. I think there could be interesting approaches to them as well. Later, I came up some sketches based on the contrast principle of serenity and movement. Here are the ideas best fit the theme: serenity and movement. 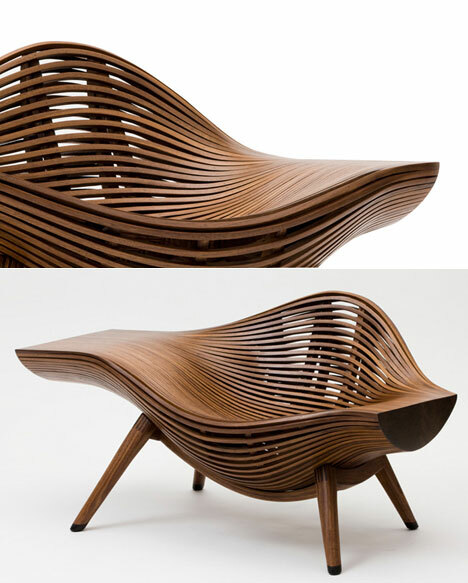 The left image below shows a rocking chair design. This high wing back chair’s exterior surfaces are covered with cane allow moderate light to come through. The enclosure look of the chair back creates the feeling of safe and quiteness, and the blackened material could also make the user feel grounded. In the combination of both form and color, the user will feel emotionally calm and spiritually serene . 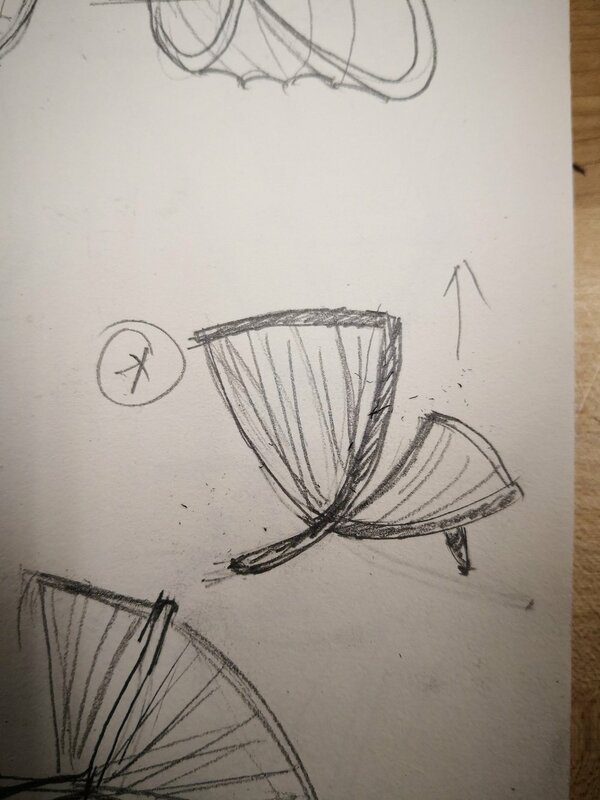 Moreover, I would purposely design one of the wings lower than the another one, which creates a dynamic spiral movement. The second image below shows a side table design. I draw inspiration from the natural lili pad to present the serenity of nature. Three different heights and sizes of the table surface creates the representation of growing (movement). The last two images present different approaches to serenity. Their interpretation of the relationship between calligraphy and furniture making is an eye opener for me. They both contain tangible and intangible characteristics. Woodworking and calligraphy both require extensive amount of practice to master. In detail, as a craft person, he or she has to understand the material in order to do the job; a woodworker needs to know characteristics of the woods, and a calligrapher needs to understand the ink and the xuan paper. As the practitioners gradually gain skills, the skills have become part of the their body, they start utilizing the skill unconsciously as a whole, that is when they start forming their spirtual realm. While a person completely submerges into the practice, his or her mind is in that spiritual world, but the body is in the motion of doing the work. In the spiritual world, the person’s focus reaches the peak and emotion feel absoutely serene; his/her mind constantly speaks with the material in order to form the work. At the same time, their physical movement is in control of the rhythm of thinking. Interestingly, during these processes, the concept of time seem disappears. Overall, these mind work processes are intangible, but the end result of the practice is opposite. In another word, a beautiful calligraphy character or a piece of well made furniture is a projection of creative thought, and it is an extensive result of thinking through making. The intangible agency transmits through the tangible project. Later on, I have concluded the idea of thinking through making and spirital serenity. I think there are two things feeding back and forth are thinking and making, they are communicating throughout the entire work process. However, there is one only thing stay still, the emotion. It could be a very interesting approach to furniture that I am going to make. For example, a rocking chair creates a back and forth ( two movements ) physical moveablility by the rockers; and the high back wings create an emotional sense of calmness. I was also think about the spiral chair back could present the flow of the time based on the Einstein's Theory of General Relativity ( I think I have gone CRAZY here!!!). 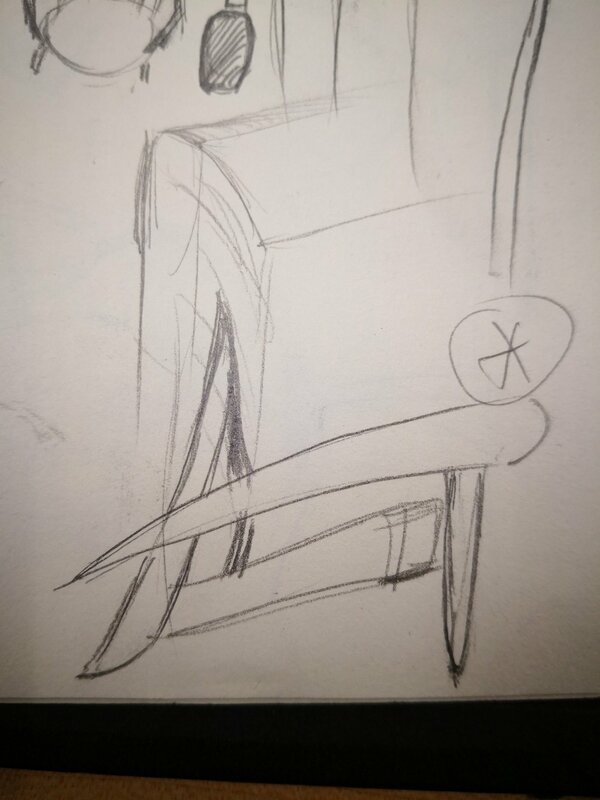 Additionally, I was inspired by an Korean furniture maker Sanghyeok Lee (https://www.ignant.com/2016/01/06/studio-lee-sanghyeok/). 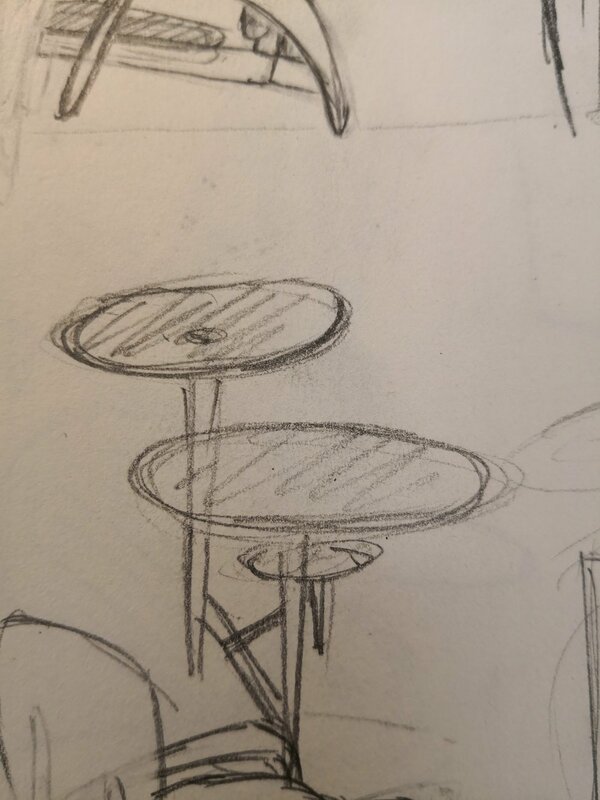 I am very interested in creating a mechanism (air pressure or gears) that could make two of the lili pad table tops moved by each other. Of course, the third table will stay fixed to represent the serenity. — Siqi, D. (2018). Chinese characters and the spirit of place in China. Technoetic Arts, 16(1), pp.99-111. 1. The every ending is potentially a beginning; between the beginning and ending, the practitioner’s movement are continually and subtly responsive to the ever-changing conditions of the task as it unfolds. 2. Rhythm, movement must be felt. And feeling lies in the coupling of movement and perception that, as we have seen, is the key to skilled practice. — Ingold, Tim. “Walking the Plank: Meditations on a Process of Skill.” Defining Technological Literacy, 2006, pp. 65–80. 1. Lupo, E., Giunta, E. and Trocchianesi, R. (2011). Design Research and Cultural Heritage: Activating the Value of Cultural Assets as Open-ended Knowledge Systems. Design Principles and Practices: An International Journal—Annual Review, 5(6), pp.431-450. This research paper aims to give evidence to the value of incorporating culture and cultural heritage in design research, and demonstrate how the design discipline can contribute in the Cultural Heritage (in its tangible and intangible aspects, from artifacts to processes, practices and performances), through designing sustainable, socially and economically, repertories of knowledge evolve and transform the nature of cultural heritage. The article presents an experimental project” Inspired by Beijing Opera” which proves this heritage activation by design, that opens the patrimony to new interpretations without losing the concept of its traditional matrix. This paper is very helpful to guide my research method on traditional cultural heritages, especially on converting intangible meaning to tangible object. By interpretative design process, identify, clearly distill and conclude the essence of a cultural patrimony in its cultural archetype and expressed by visual form and material. The paper uses very strong example to demonstrate its opened-ended knowledge system, however its argument is only limited on the single project. 2. Bailey, R. and Townsend, K. (2015). Craft and the handmade: Making the intangible visible. Craft Research, 6(2), pp.157-163. The article use four example to illustrate as part of an expanding landscape of both commercial and public sector platforms, contemporary applications of the handmade craft can serve to generate new experimental modes of thinking and making which not only challenge our preconceptions of what craft is, but also what it has the potential to evolve into. 3. Hue, M. (2009). Promotion of spiritual development: exploration of the self and spiritualism through the practice of Chinese calligraphy. Pastoral Care in Education, 27(1), pp.63-76. The article argues that heritage calligraphy serves as more than a utilitarian function; the author aims to examine the cultural meaning of Chinese calligraphy and its practices in general, and specifically its connection to spiritualism. The methodologies of narrative approach and textual analysis were employed based on interviews. The article uses examples from school practitioners to raise the importance of calligraphy for spiritual development. The Chinese calligraphy and woodworking have commonality in many ways, they are both the practice of spiritual discipline. 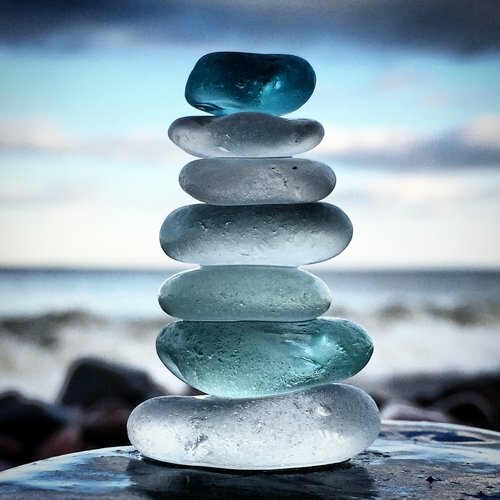 This article is a great resource for me to explore the spiritual realm and find the supportive evidence to spiritual serenity. But this article introduces the philosophy of Dao; it is a bias religious approach for some people, which is something I need to aware and avoid. 4. ANDRIJAUSKAS, A. (2016). VISUAL ARTS AND MUSIC IN TRADITIONAL CHINESE ART SYSTEM. Music in Art, XLI/1–2, pp.166-187. This article aims to explain why Chinese traditional aesthetics is an uncommonly distinctive cultural phenomenon which created by the spiritual values of a great civilization. How did this wonderful spiritual culture form over the history? Chinese aesthetic is a result of absorbing new content in every period of dynasty; and creatively reform and evolve become ever richer and more multi-layered. Specifically, the paper discussed about the rise of visuality in calligraphy and argued from calligraphy, artist’s inner culture and individual personality are visibly conveyed. It is a great example of convert intangible into tangible, and could help me to expand and connect my idea to my culture. Additionally, the evolution of Chinese aesthetic is an interesting and historical approach to innovation and creativity, it is exactly what we are doing, making changes for the future. Unfortunately, the author only touched the surface of what I want to present in my thesis. 5. Tsui, C. (2013). From Symbols to Spirit: Changing Conceptions of National Identity in Chinese Fashion. Fashion Theory, 17(5), pp.579-604. This article argues that the evolution from the use of traditional Chinese symbols to the Chinese spirit within the fashion design world signifies a new form of Chinese nationalism: instead of delivering Chinese culture in an explicit, direct, and exterior form, Chinese designers have switched to convey their unique “Chineseness” in a subtle, indirect, and hidden form. This article provides a great pioneer example to people and guide the direction of future of the traditional furniture making, I think Chinese furniture should not limited on the symbolic form, such as Ming Dynasty Chair etc., the power of the culture should come from its spirit and essence. I would like to emphasis this spirit by not only present the cultural spirit on the furniture also create the spiritual link between the user and the furniture. The author uses many interviews to prove the idea of from symbol to spirit in contemporary Chinese fashion design. But, I think it is maybe not convincing to compare fashion industry and furniture design. 6. Siqi, D. (2018). 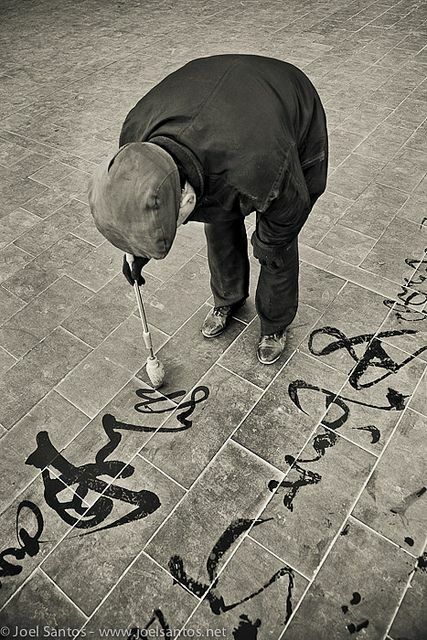 Chinese characters and the spirit of place in China. Technoetic Arts, 16(1), pp.99-111. This article explores the history of the Chinese characters and the rules for creating them; then, it reports on the possible transfer of these rules and principles to the design of architectural spaces. It is trying to find out how traditional building could become contemporary without losing its connection with the past. I think it is very useful article in terms of relating architecture to calligraphy, because the composition of the architecture is just like the composition of furniture. The rhythm we see in the calligraphy is a synonymous subject we see in the balanced design. The partial of this article could relate to the idea of thinking through making in my thesis. 7. Ingold, Tim. “Walking the Plank: Meditations on a Process of Skill.” Defining Technological Literacy, 2006, pp. 65–80. 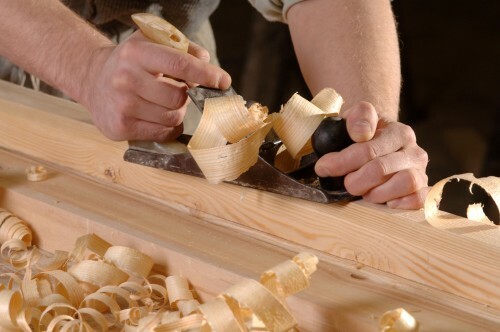 In this section of the book, Tim talks about a process of himself making a bookcase out of raw wood and illustrates three themes of fundamental significance for the proper understanding of technical skill: the processional quality of tool use, the synergy of practitioner, tool and material, and the coupling of perception and action. I really enjoy reading his idea of quality of the outcome depends at every moment on the care and judgment with which the task proceeds, which explains my nucleus professional ethic of attention to detail in every single step. He also argues that rhythm and movement must be felt, they are the keys to skilled practice. Rhythm is not a movement but a relation between movements, and working rhythm goes hand in hand with concentration. Interestingly this idea overlaps the concept of the rhythm of the calligraphy is created by the movements and pauses in writing, which is also an expression of showing inner sensations. Overall, I could draw ton of connections between calligraphy and woodwork from this article, but I also think I need to find some counter arguments against him. In Tim Ingold’s speech, he argues that making, as an inherently mindful activity in which the forms of things are ever-emergent from the correspondence of sensory awareness and material flows in a process of life. In other words, making is to project the form onto the material. The theory and the mental work come before its application and execution. The creativity generates from the flow of the transformation process of material, from the movement of the imagination and sensory awareness and from the process of improvisation, thinking through making. Every object is a way station to the next one, and every thought is a passing moment in a process of thinking, which means every ending is a beginning. He uses weaving and stone as examples to explain history of material of making art in order to emphasis the importance of understanding material. More importantly, Tim believes that thinking through making generates knowledge from inside of our own practice. I think thinking and making both are ongoing activity, and there are both having correlations to the spiritual world I am arguing in my thesis, because I think thinking is psychological work and making is physical work, but the rhythm is presentation of sensation. Interesting talk of Thinking through Making from the Professor Tim Ingold, University of Aberdeen, Scotland. Old thesis intention from last year: my thesis will explore how historical and cultural objects that inspire an emotional response through furniture. What are some of the questions you ask yourself as you work? · Design has to be balanced, elegant, attractive. · Manage my time efficiently. · Pay attention to details on both design and fabrication. · Each step is correct, finish it in a fastest way. Think of your work as a question. What does it ask? What does the work do? · How much is it? What information does it transmit? What style of design is it? Who made it? How it was made? How long it takes? What kind of quality does it have? 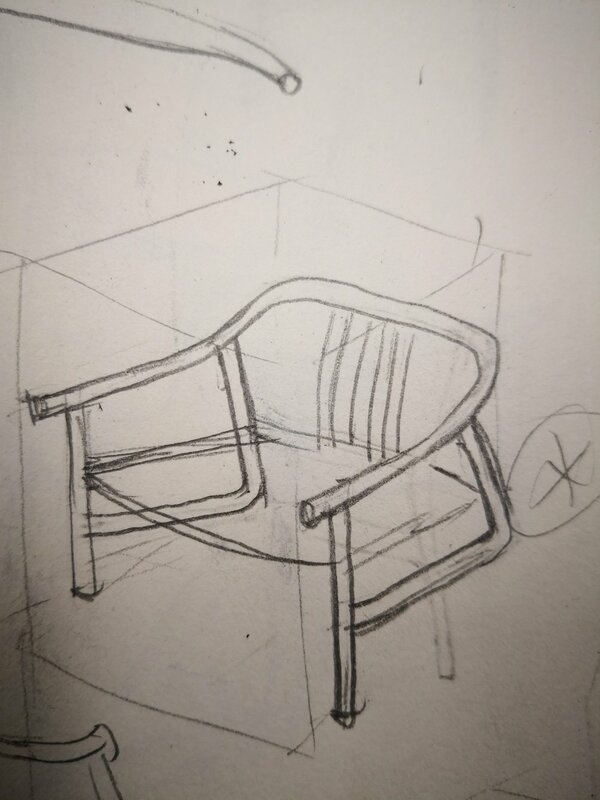 The work should answer my identity as a Chinese furniture designer and maker who is influenced by western culture, and present the work in my design perspective and fabrication quality. What is the question most posed by others about your work? · Interesting, beautiful, creative, contemporary, attention to detail, quality. 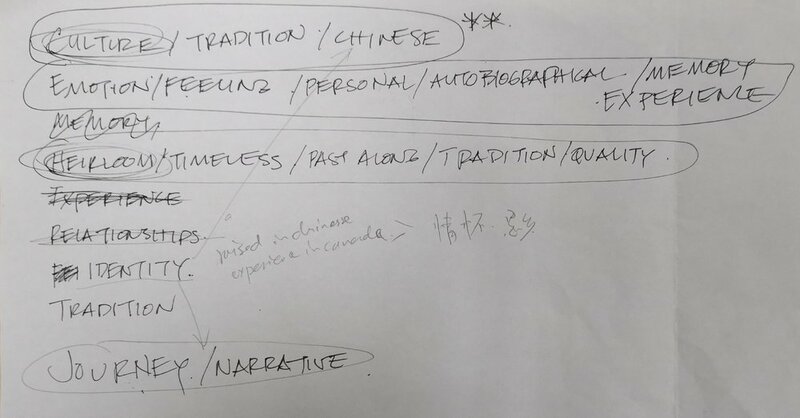 From the week 2 workshop, by proposing and answering questions, the instructor has helped me to narrow down some key words from my last year thesis proposal: culture (tradition, Chinese), emotion (feeling, personal, autobiographical, memory, experience), heirloom (timeless, passed along, quality) and nostalgia (journey, narrative). I drew connections between these words, and came up the idea about the emotion response to the traditional Chinese cultural heritage in the contemporary culture and further developed into “To explore the future of traditional Chinese cultural heritage in contemporary culture”. From my perspective, there is an emotional bond to preserve heirloom tradition in cultural aspect. I believe the spectrum of the cultural heritage is narrower than historical object, and it is easier to pick and develop to furniture, because they are still existing and contain very rich history. Create a vessel which is a physical representation of either your aesthetic, theoretical framework or an aspect of your thesis. 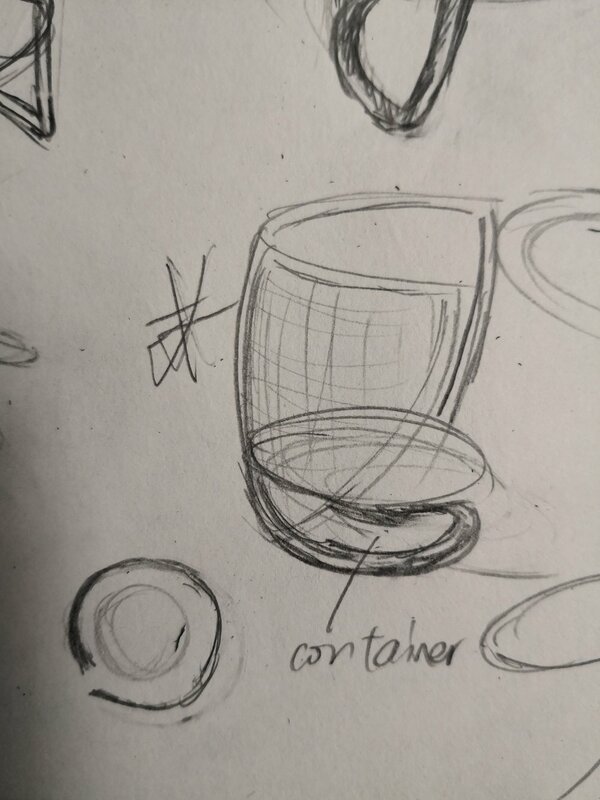 Students will be asked to create a physical concept of a container which will relate to either their design aesthetic, a specific theory, or an aspect of their thesis. The object must be rendered in physical materials to showcase the conceptual theories behind its form and materialities. Personal design aesthetic must be addressed in the presentation of your object. This is an exercise in time management and understanding successful deliverables within a specific timeframe. While the fabrication of the containers will be considered in the marking breakdown, it is more important to focus on choosing the appropriate materials to have a 3D example of the concept to present to the class the following week. 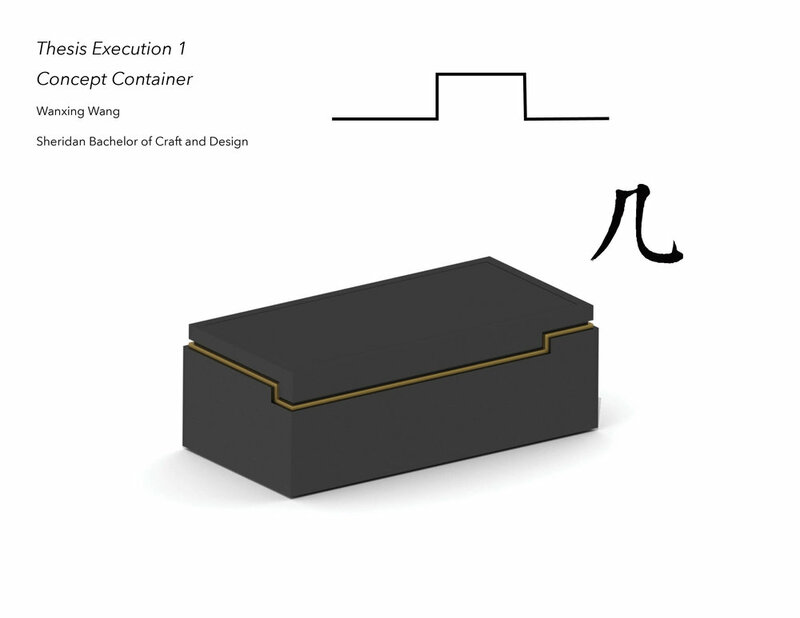 The concept containers will be considered for overall form and aesthetics in regard to your practice and/or thesis. 几（ji）Box. 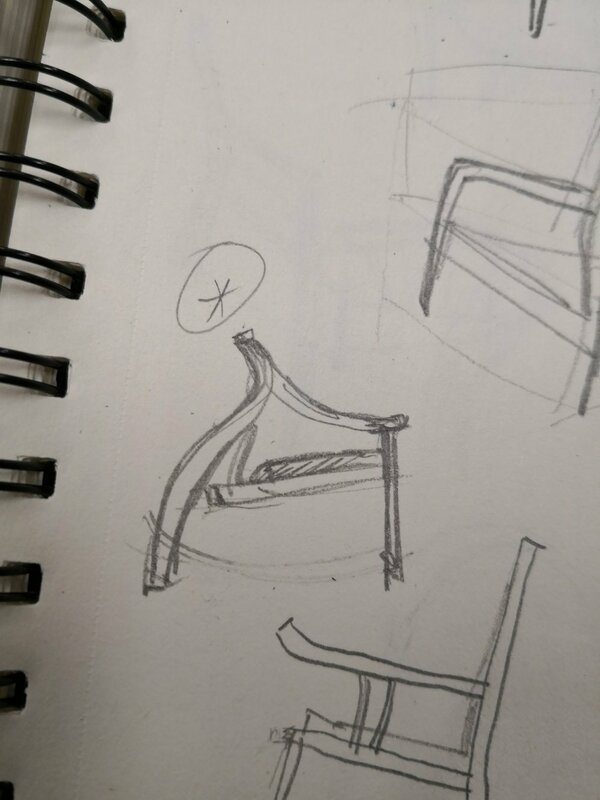 Thesis design challenge 1... "Ji" in Chinese means furniture, this design uses the simple line to represent the character 几, furniture. Material choice blackened oak and inlayed with brass. Over the week, I debated between the context of Chinese traditional cultural heritage and intangible cultural heritage (https://www.culturalheritagechina.org/). 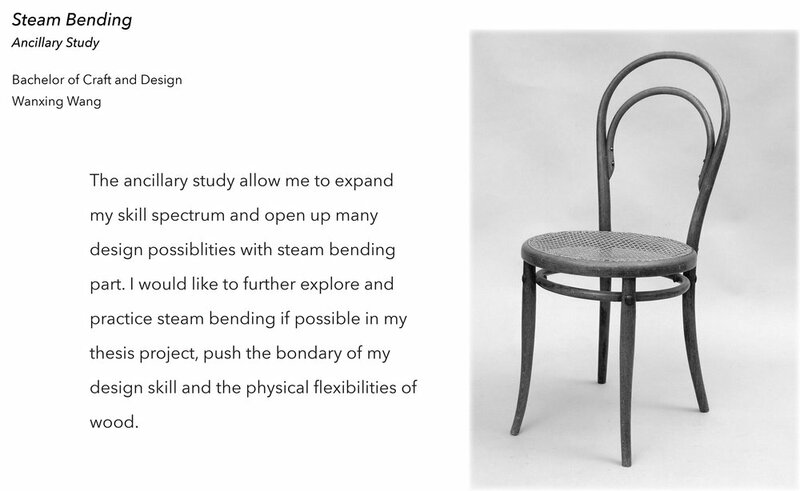 Later, I wrote my thesis intention on to explore the future of traditional Chinese intangible cultural heritage (ICH)in contemporary culture through furniture. My concept section will be focusing on using examples to discuss the important value of ICH within Chinese culture and to answer the question of how we legally preserve these precious cultures in the contemporary world. ICHs are the forms of heirloom, as it is a Chinese tradition, how do we ensure to pass them along to the next generations. From the generation to generation, a strong emotion bond fuels the heirloom tradition, and it have made us who we are (identity). Moreover, I am going to address my perspective about the relationships between the traditional heritage craft and the contemporary craft, contrast them in the micro and macro levels. In the past decades, China have been known as the world factory, what does the Made in China mean to the ICH? I am going to illustrate and explain the relationship and differences between the ICH craft and the contemporary manufactory. 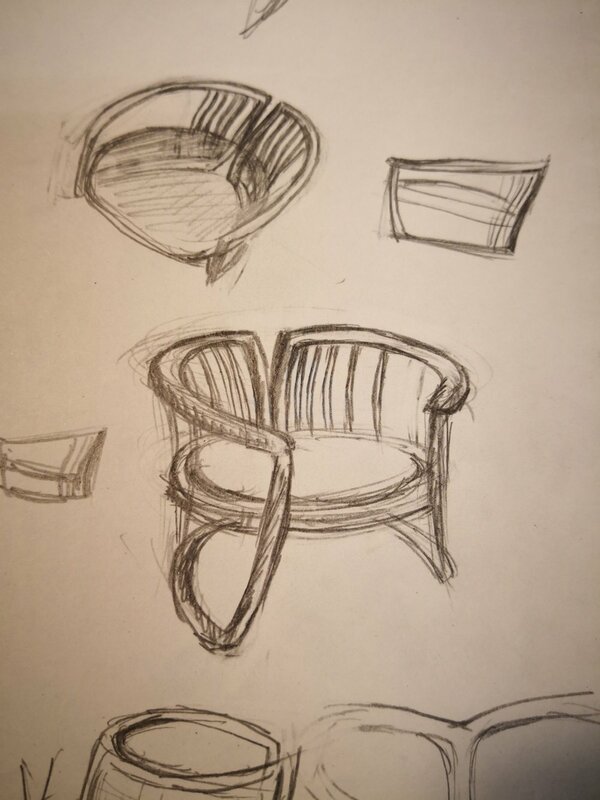 As a Chinese designer and furniture maker who both educated and lived in eastern and western culture for very long time, it is very interesting for me to talk about the meaning of ICH to me and what does is affect my design. More importantly, I think culture is always changing, so does the ICH, we need to find a creative and innovative path that could keep ICH alive and change accordingly, at the same time, increase its public awareness and attractiveness within the cultural globalizing world. Finally, I will draw inspiration from iconic and interesting details of the Chinese intangible cultural heritages and incorporate them to my works, to present a set of furniture and to convey my perspective of the future of the Chinese ICH to the public. To design and create a collection of furniture that includes a lounge chair, a side table and a console table/cabinet or a screen. (The last piece may alter base on the time frame.) 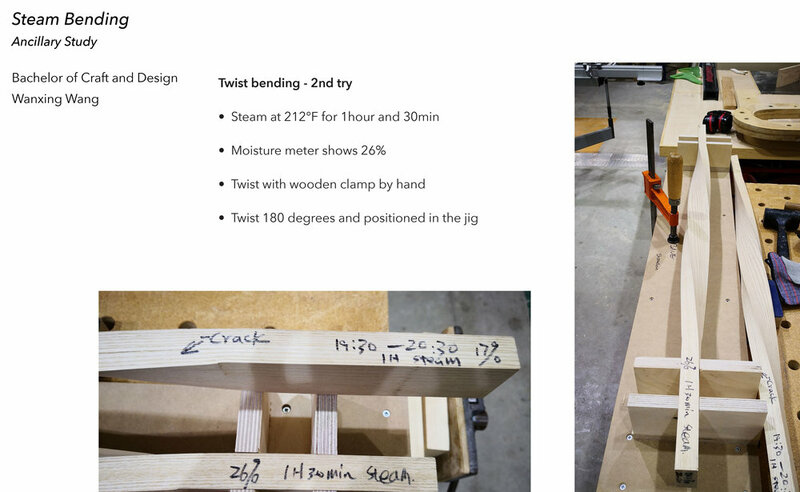 I would like to explore the steam bending technique on this project and may incorporate some meta practices as well. I aware about it was difficult to define intangible cultural heritage, and it is even harder to present it on a piece of furniture. I had a discussion with my mentor from outside of the program. First, we thought the idea of tangible vs. intangible is interesting to apply to the development of culture. Each of heritage object is an individual evidence of embedment of knowledge, made by individual craft person who carries intangible cultural heritage skill. 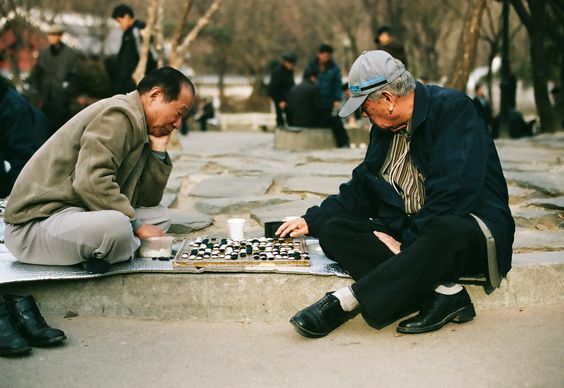 Second, the skills they master was passed along by generations, and these skills are not only required psychological understanding, also physical technique practices. It is called imaginative knowledge. More importantly, the knowledge transfer is a Chinese tradition and is socially constructed by education, community, re-imagination, technology, global interaction, innovation and believe, etc. Tradition preserves and encourage the ongoing development of culture. Our conversation was effective, and I think the information he offers was very interesting. During the Thursday class, I have presented the idea of imaginative knowledge to both instructors; they suggested me some articles to research ('Making and Thinking' by Andrew Harrison, 'A theory of Craft' by Howard Risatti, and any text by Tim Ingold) and the idea of the skilled object. But my question about the argument still remain: how can I use the intangible thoughts, memory and knowledge and translating it into a physical entity? I feel this can hold all of the ideas that you are talking about, but it is only a suggestion.. I encourage you to research ‘thinking through making’ texts and/or ‘design as research’ which are similar methodologies in design and craft. • the customs, arts, social institutions, and achievements of a particular nation, people, or other social group: Caribbean culture | people from many different cultures. Flow of skill, imaginative knowledge, reflective furniture, folks furniture, skilled objects, culture for space. I told myself to step back and re-evaluate my own identity as a Chinese furniture designer; if I was going to make something I like, what would that look like. I realized that I was going for a furniture style, my aesthetic, my taste; the image dairy was a perfect example. It is very important to keep in mind to research archetypes and symbols from Chinese culture. Then, I rewrote a list of forms of Chinese culture that I like to explore: calligraphy, Beijing opera, oil paper umbrella; I collected some important characteristics been a Chinese: traditional, united/undivided, culture, patriotic, advocate peace, harmonious, interactive, history, craft, heirloom/heritage. · Chinese calligraphy: consistency, integrity, balance, correspondence, spacing and rhythm, skill, heritage. · Beijing opera: theatre, costume, technique, clothing, actor/actress, spirit, music, prop, stylist, dream landscape, skill, heritage. · Oil paper umbrella: poetic beauty, ritual (wedding, death), symbolic meaning (harmony), help ward off bad luck, romance, beauty, literature, endurable, handcrafted, skill, heritage. I concluded my ideas to “meaningful objects”. The object is considered as an agent; it can transmit maker/designer’s agency and change people’s perception. Design is end result of education; because through education, we as designers unconsciously or consciously apply our own funnel theory (our own taste, aesthetic, filter) to our design. On the one hand, we as the designers/makers, share the experience and taste through the object and embodiment of search for meaning and search for beauty. On the another hand, viewers interpret design in their different ways; however, the energy embody within the object could be transferred. Overall, there is an intangible function within a functional tangible object. This screen design has Chinese cultural influence in it. Combining traditional Chinese folding paper fan with linear rectangle frames, two ordinary items have made an extraordinary contemporary design. Interestingly, small holes have been carefully considered in the design. This important detail elevates the elegance and transparency of the screen. “WU.” Flickr, The Earth Awards, Sept. 2009, www.flickr.com/photos/theearthawards/4812723071/in/photostream/. WU” is a lamp made of rice paper and bamboo to express a Chinese philosophy. “You” (something) and “Wu” (nothing) are dialectical themes in Laotzu’s theory. It allows the user to create the lamp shade freely on the basis of a bamboo framework. It is made out of bamboo sticks and covered by traditional rice paper. This elegant light design mimics the form of a natural lotus leaf. The light frame is made of bamboo, and it is covered by traditional rice paper. Its pure natural material selection makes me feeling grounded and safe. The whole design brings serenity and comfort to the environment. The lighting installation is implemented with traditional Chinese architecture. The designer creatively uses LED lights to represent roof tiles which greatly emphasis the nucleus of the idea of the great roof. The repetitive linear sticks compose an interesting structure. It makes me imagine a construction site, and it is repairing, building or rescuing the disappearing great roof. The individual of circular patterned panels has made me recall a old object: Pushan which is made of cattail leaves. It is a great example of creating resonance between the audience and the designer. This particular design has brought out many beautiful childhood memories from me. In addition, the repetitive panels are oriented in a thoughtful composition which gives balance in its chaos. Shen, Baohong. “Small Wide Chair.” Moodboardmix, Tumblr, 2016, moodboardmix.tumblr.com/post/130120780621/small-wide-chair-by-shen-baohong-u-furniture-wdh. The chair design is inspired by traditional Chinese Ming style chair. Outstandingly, its simplicity and elegance has reflected the cutting edge of contemporary design. This design perfectly created conversation between the history and the modern people. Yen, Ian. “‘Float’ Tea Set.” Designboom, Designboom, 18 Aug. 2017, www.designboom.com/design/ian-yen-rethinks-chinese-tea-culture-philosophy-shape-float-tea-set-08-18-2017/. “It moves” was my first impression to this Float tea set. Sliced tea cup design make me feel like there is a melody whispering in the back ground. This tea set is just like floating on a murmuring river, bringing a leisure and relaxed mood to me. Chen, Ming. “Hangzhou Stool.” Designboom, Designboom, 10 Apr. 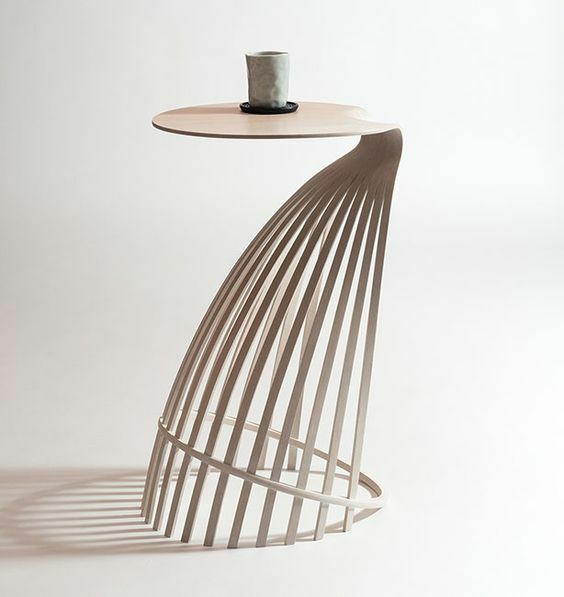 2013, www.designboom.com/design/hangzhou-stool/. The stool not only has a very unique form, but an interesting material application. It is made of many layers of bamboo veneers. The displacements between the veneer layers creates an amazingly transparent design. More importantly, the spaces between layer could be compressed and creates the comfortable seating area. Kobayashi, Yuri. “-Sui-.” New Work by Faculty 2016, Center for Furniture Craftsmanship, 16 Sept. 2016, www.woodschool.org/wood-school-gallery/archived-exhibitions/61-messler-gallery/exhibitions/711-new-work-by-faculty-2017. This design makes me feel comfortable and organized. I really enjoy appreciate design that has very simple organic form but takes extreme experience and skill to accomplish the result. Linear elements on this design provides lightness, and solid table top brings the functionality. The idea of transition from light to heavy, from transparent to solid is stunning. This is an example of my ultimate goal. 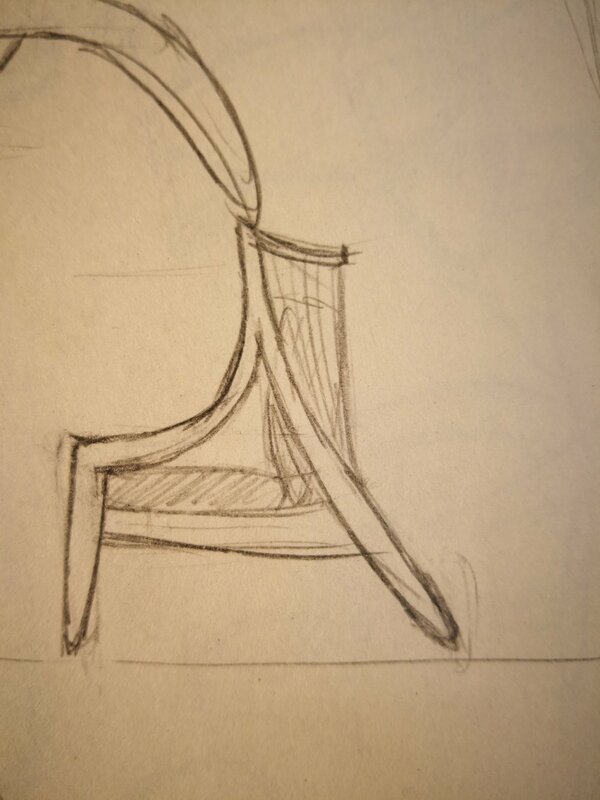 I really like the dynamic form of this chair design. A continuous arm back rest connects all the spindles together. A horizontal stretcher receives spindles come from different angles. The interesting composition of its linear elements together create a compelling focal point and an echo in eye movement. Hwa, Bae se. “Steam 11.” Designboom, Edward Tyler Nahem Fine Art Gallery, 22 Mar. 2014, www.designboom.com/design/korean-contemporary-furniture-design-bae-se-hwa-03-22-2014/. Similar to the -Sui- table, the idea of transition from solid to transparent and back to solid is very attractive. Its organic form is very inviting, and it looks very comfortable. However, the design itself makes me feel a little bit retro and off track of idea of contemporary design. NESTEDNY. 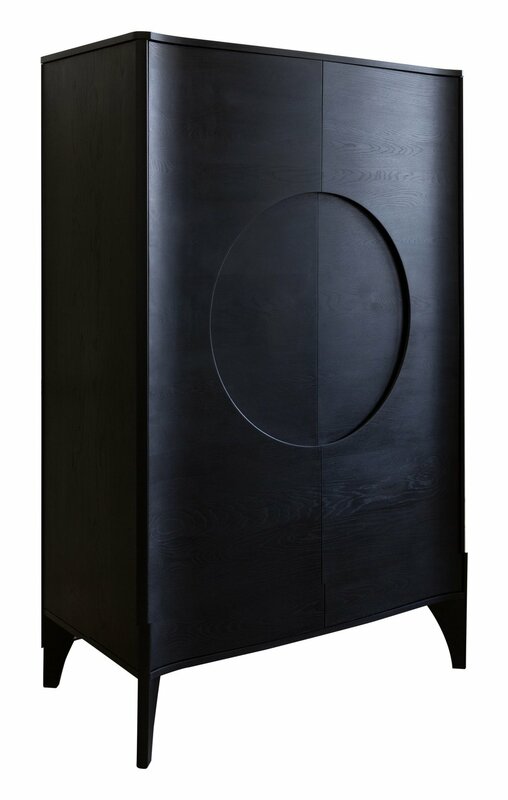 “Noah Drinks Cabinet.” Dering Hall, NESTEDNY, 2018, deringhall.com/noah-drinks-cabinet. The indent area reminds me the traditional Chinese bronze door latches. Historically, circular latch plates are often used on cabinet doors like this. The central circular indent has angle edge all the way around, which simply functions as door handle. 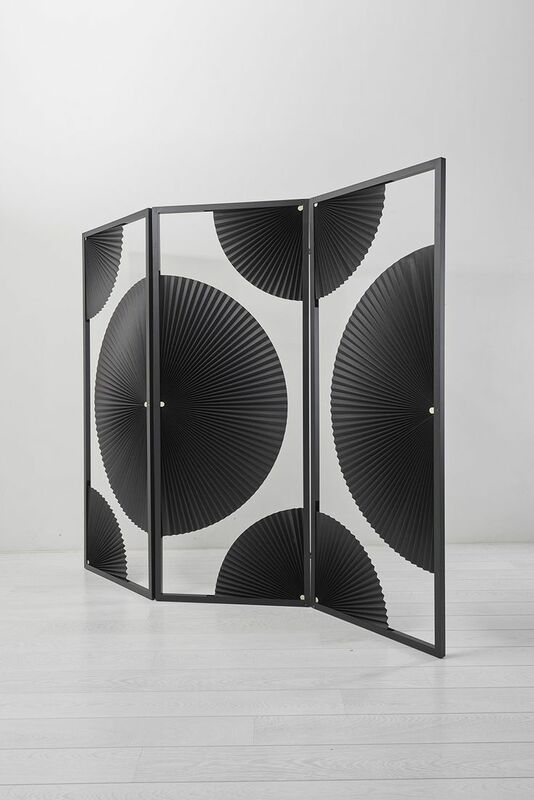 The door curls with a small angle which infuses some playfulness to this design. Additionally, blackened solid wood provides very graphic and contemporary look to the surface. These interesting and subtle details make the cabinet stands out.